Introducing solid foods to your baby is a really big milestone. This milestone is a lot of fun and a lot of worry as well. One of the most important things to keep in mind is that your baby has so many years of food experiences ahead that there is no need to rush things! Remember, you are taking the first steps to helping your little one develop healthy eating habits that will last a lifetime. 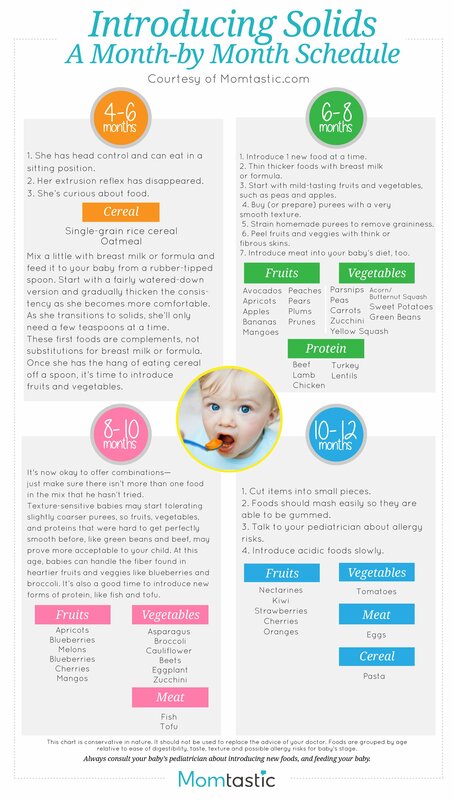 Here you will find pages of useful information and solid food charts for you to review and get a sense of what your baby may be eating at a certain age or stage. This information will help ease your mind as you are introducing solid foods and will also ease the transition to solid foods for your baby. Current recommendations indicate that breast milk or formula should be baby’s main source of nutrition until at least 6 months of age. While many pediatricians recommend starting solid foods sometime between 4 and six months of age, the earlier introduction of solid foods may have certain risk factors; consult your pediatrician. For example, the “Introduction of complementary feedings [solid foods] before 6 months of age generally does not increase total caloric intake or rate of growth and only substitutes foods that lack needed nutrients and the protective components of human milk (and formula). How do you know if your baby is ready for solid foods? There are many signs to look for that will indicate that your little one may be ready to begin the journey into solid foods. Your baby may be 3 months old or 4 months old when you start to feel she may need “something more” than formula or breast milk. Maybe she is beginning to awaken more often at night or eat more often than “usual” and you wonder if introducing solid foods may be what she needs.Please keep in mind that a growth spurt will occur between 3-4 months of age. Your baby may begin to wake more frequently at night for a feeding and/or may being to eat non-stop (cluster feed) as she once did as a newborn. Read more at Is Your Baby Ready for Solid Foods? When you find that your baby is ready for solid foods, consider skipping the boxed cereal and starting out with avocado, sweet potato, banana or pear! You should give your baby one new food at a time, and wait a a minimal of 2 to 3 days before starting another. Many parents follow the “4 day wait rule” and choose to wait 4 days between introducing new foods. After each new food, watch for any allergic reactions such as diarrhea, rash, or vomiting. If any of these occur, stop using the new food and consult with your child’s doctor. Visit the Allergies & Baby Food page to learn more about these changes as well as about allergenic foods. Remember, the World Health Organisation, the American Academy of Pediatrics, Health Canada, Health Insite – Australia and the Department of Public Health (U.K.) as well as the CDC all recommend that babies receive nothing but breast milk and/or formula for the first 6 months of age. What does the WHO say?